The site is praised by one analyst, but he also says it could give more details about certain departments, including who receives $660 million in state grants and tax credits. AUGUSTA – Gov. Paul LePage wants you to know that Maine taxpayers spent more than $32,000 on food served last year at the Blaine House, the governor’s mansion. Maine Open Checkbook, an open-government website that the governor touted in his State of the State address Tuesday, is live and largely complete. 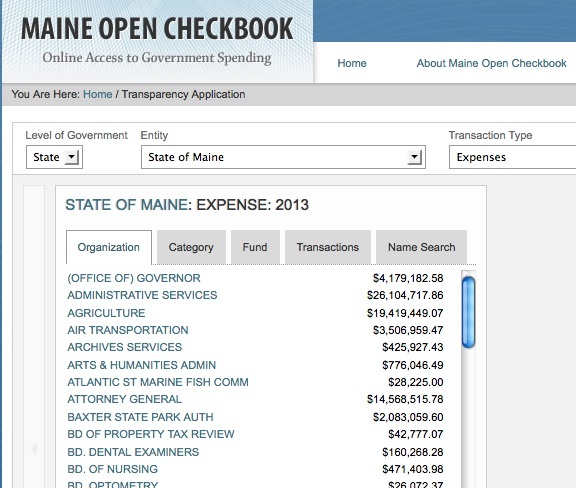 A screen shot from the Maine Open Checkbook website, opencheckbook.maine.gov. It shows state expenses ranging from employees’ salaries to $106 in purchases of canned fruits and vegetables for the Blaine House. In Tuesday’s speech, LePage highlighted Republican-led campaigns to root out waste in two quasi-governmental agencies, the Maine Turnpike Authority and the Maine State Housing Authority. The site has already been praised by an analyst for the U.S. Public Interest Research Group, a consumer advocacy group. In a news release Wednesday, the group said the site brings an “unprecedented level of transparency” to Mainers. But the group also said there is plenty of room for improvement, such as identifying the recipients of $660 million in state grants in the fiscal year that ended June 30 and recipients of certain tax credits. The group also criticized LePage for singling out the turnpike and housing authorities in his speech, because the website has little information on their finances. Terry Brann, who is the state’s controller and the overseer of the website’s creation, said data will be added as confidential information is redacted from data sets and agencies are brought up to speed on the site. More than 5 million records were used to create the site, according to LePage’s office. Maine has been behind the national curve on using the Internet to promote transparency. The U.S. Public Interest Research Group gave the state an F grade in 2011 and a D- last year — ahead of only 12 states. Brann said the grading drew LePage’s ire. “One of my first notices from the governor was a copy of the article with a little note that said, ‘We can do better than this,’” Brann said. In 2011, a bill to establish a transparency website was introduced in the Legislature. The measure was killed, but Brann said his office got the site up by drawing on the office’s existing budget. The cost was $30,000, he said. LePage campaigned on transparency, but many have criticized him for a lack of it, especially in 2011, when he issued an executive order shielding a business advisory council he created from public access laws. That was criticized by the Maine Heritage Policy Center, a conservative advocacy group with close ties to the governor. The group runs MaineOpenGov.org, a website similar to the state’s new one, although it’s broader, with little focus on small-scale expenditures. Among other things, it tracks spending on salaries, welfare and K-12 education, along with property tax data.